I have a UILabel with space for two lines of text. Sometimes, when the text is too short, this text is displayed in the vertical center of the label. How do I vertically align the text to always be at the top of the UILabel? There's no way to set the vertical align on a UILabel, but you can get the same effect by changing the label's frame. I've made my labels orange so you can see clearly what's happening. If you have a label with longer text that will make more than one line, set numberOfLines to 0 (zero here means an unlimited number of lines). I'll make my label in code so that you can see what's going on. You can set up most of this in Interface Builder too. My setup is a View Based App with a background image I made in Photoshop to show margins (20 points). The label is an attractive orange color so you can see what's going on with the dimensions. // 20 point top and left margin. Sized to leave 20 pt at right. 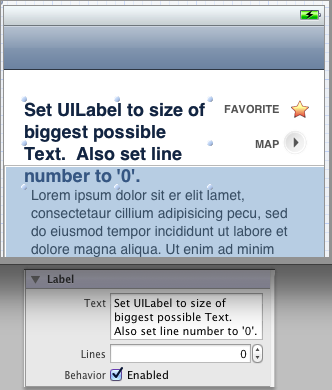 Note that sizeToFit will respect your initial label's minimum width. If you start with a label 100 wide and call sizeToFit on it, it will give you back a (possibly very tall) label with 100 (or a little less) width. You might want to set your label to the minimum width you want before resizing. Whether lineBreakMode is respected depends on how it's set. NSLineBreakByTruncatingTail (the default) is ignored after sizeToFit, as are the other two truncation modes (head and middle). NSLineBreakByClipping is also ignored. NSLineBreakByCharWrapping works as usual. The frame width is still narrowed to fit to the rightmost letter. If your label is included in a nib or storyboard as a subview of the view of a ViewController that uses autolayout, then putting your sizeToFit call into viewDidLoad won't work, because autolayout sizes and positions the subviews after viewDidLoad is called and will immediately undo the effects of your sizeToFit call. However, calling sizeToFit from within viewDidLayoutSubviews will work. This uses the NSString method sizeWithFont:constrainedToSize:lineBreakMode: to calculate the frame height needed to fit a string, then sets the origin and width. 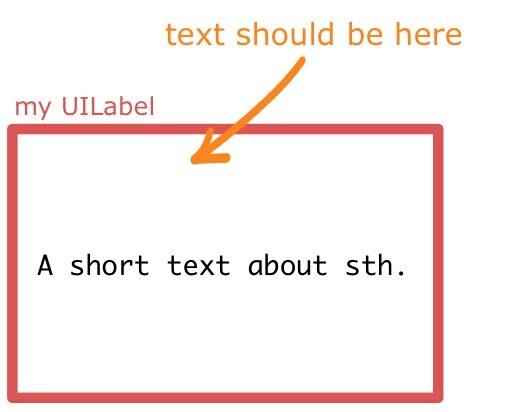 Resize the frame for the label using the text you want to insert. That way you can accommodate any number of lines. The labels frame is now just high and wide enough to fit your text. The top left should be unchanged. I have tested this only with top left aligned text. For other alignments, you might have to modify the frame afterwards. Also, my label has word wrapping enabled. Similarly, alignBottom should be updated too with a @" \n@%" in place of "\n@%" (for cycle initialization must be replaced by "for(int i=0..." too). Then call [yourLabel alignTop]; or [yourLabel alignBottom]; after each yourLabel text assignment. Just in case it's of any help to anyone, I had the same problem but was able to solve the issue simply by switching from using UILabel to using UITextView. I appreciate this isn't for everyone because the functionality is a bit different. If you do switch to using UITextView, you can turn off all the Scroll View properties as well as User Interaction Enabled... This will force it to act more like a label. An even quicker (and dirtier) way to accomplish this is by setting the UILabel's line break mode to "Clip" and adding a fixed amount of newlines. This solution won't work for everyone -- in particular, if you still want to show "..." at the end of your string if it exceeds the number of lines you're showing, you'll need to use one of the longer bits of code -- but for a lot of cases this'll get you what you need. I've struggled with this one for a long time and I wanted to share my solution. This will give you a UILabel that will autoshrink text down to 0.5 scales and vertically center the text. These options are also available in Storyboard/IB. Storyboard solution: The simplest and easiest way is to embed Label in StackView and setting StackView's Axis to Horizontal, Alignment to Top in Attribute Inspector from Storyboard. Adjusting UILabel LefMargin, RightMargin and Top Margin Constraints. Change Content Compression Resistance Priority For Vertical=1000` So that Vertical>Horizontal . and the following constraints are enough to achieve the desired results. I took a while to read the code, as well as the code in the introduced page, and found that they all try to modify the frame size of label, so that the default center vertical alignment would not appear. However, in some cases we do want the label to occupy all those spaces, even if the label does have so much text (e.g. multiple rows with equal height). You can use TTTAttributedLabel, it supports vertical alignment. I've found the answers on this question are now a bit out-of-date, so adding this for the auto layout fans out there. The label's height will be calculated automatically (using it's intrinsicContentSize) and the label will be positioned edge-to-edge horizontally, at the top of the view. Make sure the number of newlines in the string will cause any text to fill the available vertical space, and set the UILabel to truncate any overflowing text. Because sometimes good enough is good enough. FXLabel (on github) does this out of the box by setting label.contentMode to UIViewContentModeTop. This component is not made by me, but it is a component I use frequently and has tons of features, and seems to work well. for anyone reading this because the text inside your label is not vertically centered, keep in mind that some font types are not designed equally. for example, if you create a label with zapfino size 16, you will see the text is not perfectly centered vertically. however, working with helvetica will vertically center your text. I tried the solution involving newline padding and ran into incorrect behavior in some cases. In my experience, it's easier to constrain the drawing rect as above than mess with numberOfLines. If you are using autolayout, set the vertical contentHuggingPriority to 1000, either in code or IB. 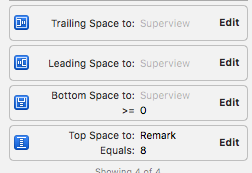 In IB you may then have to remove a height constraint by setting it's priority to 1 and then deleting it. What I did in my app was to set the UILabel's line property to 0 as well as to create a bottom constraint of the UILabel and make sure it is being set to >= 0 as shown in the image below. As long as you are not doing any complex task, you can use UITextView instead of UILabels. To make your font of label to fit to the width of screen or specific width size. Not the answer you're looking for? Browse other questions tagged ios cocoa-touch uikit uilabel text-alignment or ask your own question. 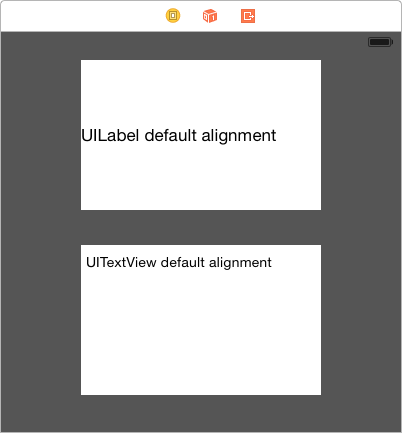 How to set top-left alignment for UILabel for iOS application? How to align UILabel text from bottom? How to add line break for UILabel?